Thank you for all your good wishes for the new year and the new journey we've embarked upon. It's been ten days here in Erlangen. We've taken on rent a fully furnished 3 room apartment - the rent is huge, but it saves us from other expenses for furniture and household equipments that we may otherwise incur. Our days are spent exploring the places near our home,the city center,some shopping for essentials and trying out some local delicacies. Rest of the time goes in trying to understand the equipments - the house is spacious,old, and hence the equipments are ancient. The German instructions do not make things easy either. The electric glass top stove took a few days to get used to - I am still burning food at times though. Back in India, the fire in the gas stove was something we could easily adjust - may be because it is something we've grown up with. And a messy stove was easy to clean..sigh!!! The vaccum cleaner is almost as big as me. I'd prefer the simple Indian broom anytime :) The top loading washing machine remains a mystery - the instructions are in German and it is unlike anything I've seen .I googled quite a bit to get some idea but the mystery remains unsolved.The worst part - even Siemens website does not have information about this product from them. Moving from living in one's own house to a rented house has its drawbacks - you're always conscious of the fact that none of this belongs to you and any damage to the objects will incur a cost . The kitchen remains my main tension point - the Indian style of cooking involves frying and so many masalas- I am afraid the pristine white cupboards will turn sticky coupled with yellow stains of turmeric ...aargh!!! I've to be very very careful. 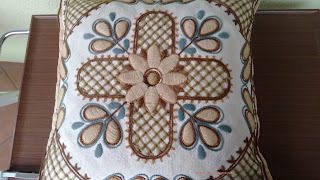 Along with the above,the owner also provided us with plenty of linen for the mattresses and the tables.On our second day in the new home, I noticed a cushion lying in one corner of the living room -it was just a single piece.I picked it up,examined it and then informed my hubby - look at this, a hand embroidered cushion cover !! 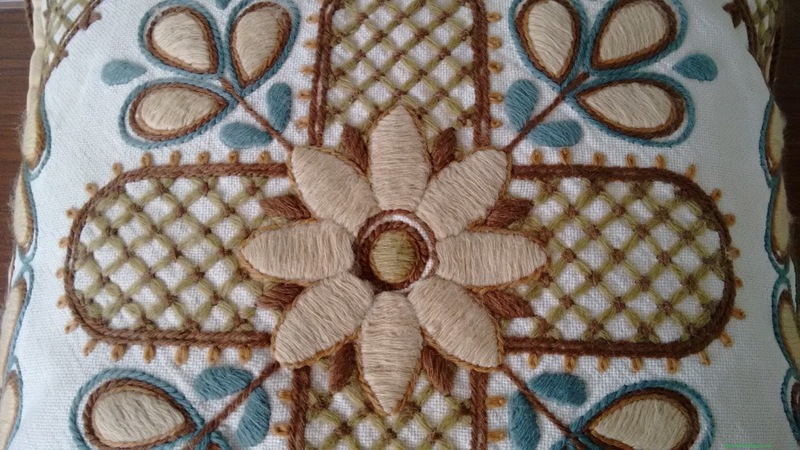 The pattern is stitched with wool and the colors are dull. But it still is beautiful. I wonder why there's only one piece? Need to search the cupboards to see if there's a partner for this lonely soul. Here's a closeup - satin ,stem,lattice work and couching stitches have been used.The couching has come off in the borders.I'll have to take up a restoration work. In the deep recesses of the cupboard, I found another pretty piece too. But this looks to be machine embroidered. Pretty isn't it? I am told that the house is quite old.So may be these are old too.. 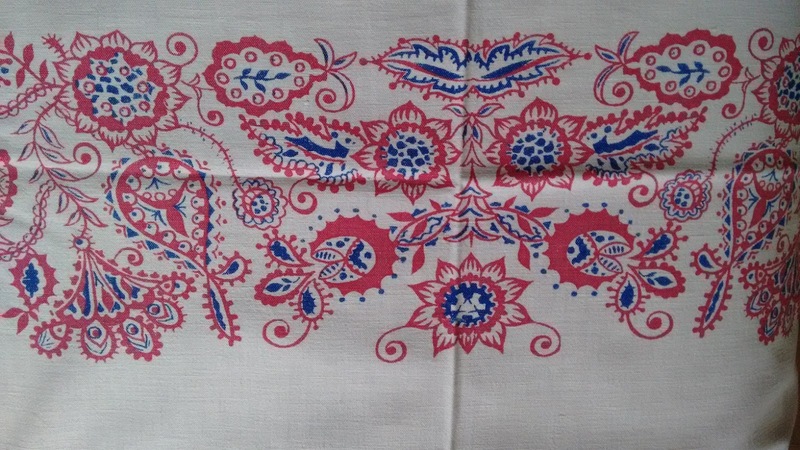 The front and the back of the embroidery. Looks like machine stitched to me. 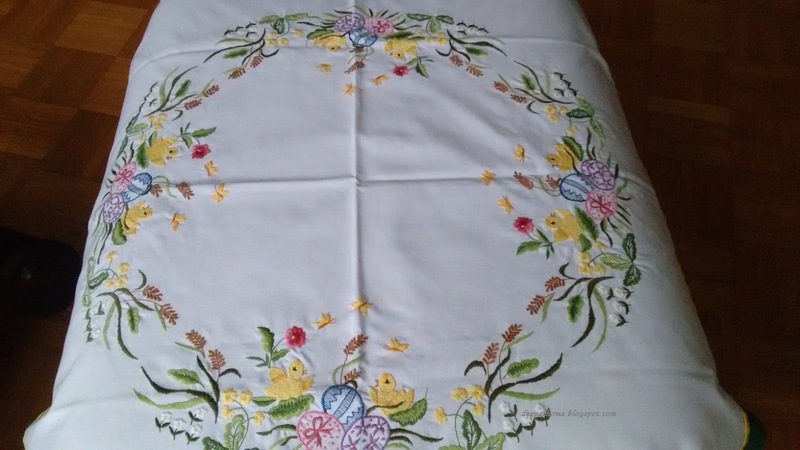 I also found another table cloth. 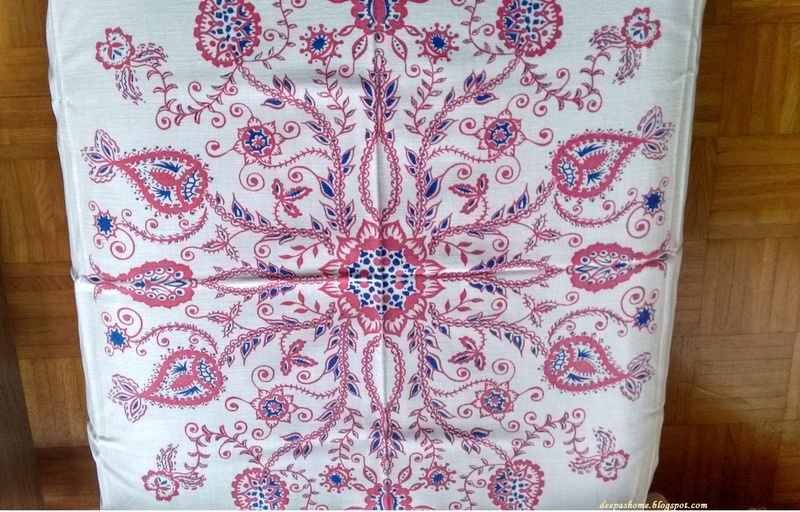 Not embroidered, but the print on it reminded me of Portuguese embroidery. Meri, are you there? I am yet to explore the yarn stores in the town. For that I need to first get acquainted with the streets and routes. It may take a few more days. Erlangen is a small city (town?) with plenty of old buildings.Each building appears to have a story of its own. There's a nice little library too and the public transport is excellent. And,oh yeah, the gentleman- Mr.Sun is a rare entity. Do we need to take Vitamin D supplements? 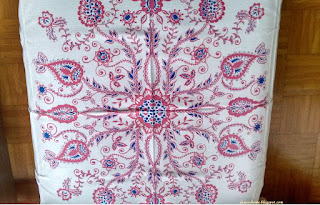 You are right the printing remind Viana do Castelo embroidery but only remind the colours red, blue and white and some designs. 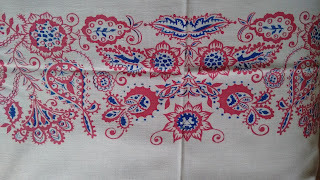 May be the inspiration could come from Hungarian embroidery. 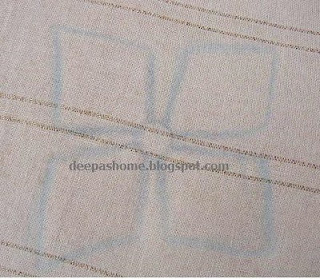 The two kinds of embroidery are similar. I'm sure you'll find beautifully places and shops. Search little and old shops in older and secondary streets - not in principal streets. In these shops is where you can find treasures. I've google Erlangen and it is a wonderful town. Well, it is Winter in Europe. And remember, especially in winter, bright sunshine, when it does appear, doesn't bring warmth with it. I've known many international students caught out by that! if i were you i would take vimin d supplements. i was put on bcse was found deficient. and i live in spain! it does take energy getting used to new surroundings. So glad that you've arrived safely and are settling in, despite the mysteries of the stove and vacuum cleaner. All in all, it's a grand adventure! Hallo Deepa, many thanks for this post I was wondering about your move to Europe. I can understand the silence you experience, it is the other way for me when I go to India! Deepa, you reminded me my days in Erlangen exactly some 10 years ago. Back then I didn't have internet at home and I was homesick all the time. We too had many problems most of them solved by our owner with our broken German and english. Best would be to get hold of some Indians in the Srilankan/Indian stores. All the best to you. Wishing you a happy life over there. Awesome blog, Deepa. Glad you're settling in, but lack of sun is a problem. Even here in the northern US where we do get a lot of sun we take vitamin D3. Perhaps you should, too. 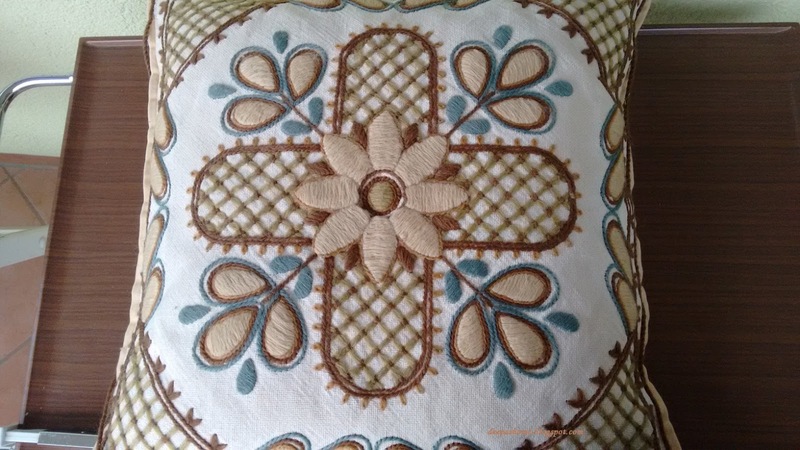 The embroidered cushion is very beautiful if quiet, and is a very traditional European style. 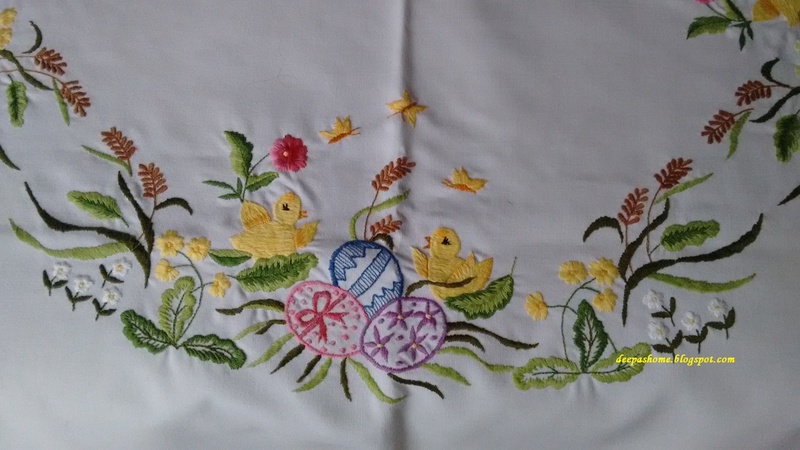 The piece with the yellow chickens and the eggs is an Easter embroidery. 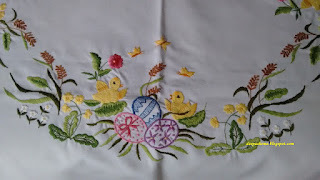 From the front picture it looks hand embroidered, but it isn't clear from the back. 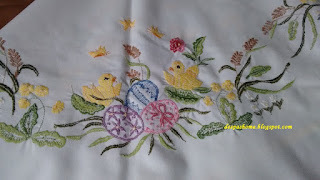 I wouldn't use my expensive embroidery thread in the bobbin, would you? I will try to get you a Siemens manual in English for your washing machine if you let me know the model. You could send the information to my email and I'll take it from there. Good luck, and some sunshine soon. Also the sound of children playing should be heard soon as spring holidays are around the corner. It's great to hear how you are getting on in Germany! Erlangen sounds very interesting - I googled Erlangen, so now have an idea where you are. I am sure you will start to become accustomed to everything quite soon! Have fun! Looking forward to reading more about your discoveries! It's so good to hear from you. I can imagine it's quite an adventure to find your way an a new country. 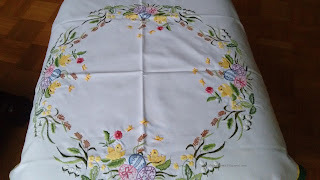 Fun to see you found some embroidered items in your new home. 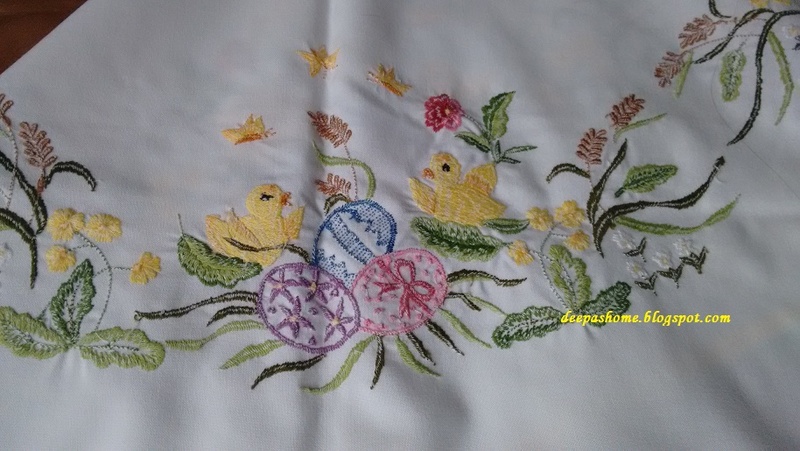 The tablecloth seems to be Easter themed. I hope you soon get used to cooking in your 'new' kitchen. I just found your blog. Hope you are settling in nicely. I look forward to your future posts. You have amazing talent. Thank you for blogging and for sharing your knowledge. Hey .. Missed you for long time. Good luck and All the best for your move. Hope things settle well soon.